Bottom Buddy, the bottom wiper answer to personal hygiene when reaching is difficult! 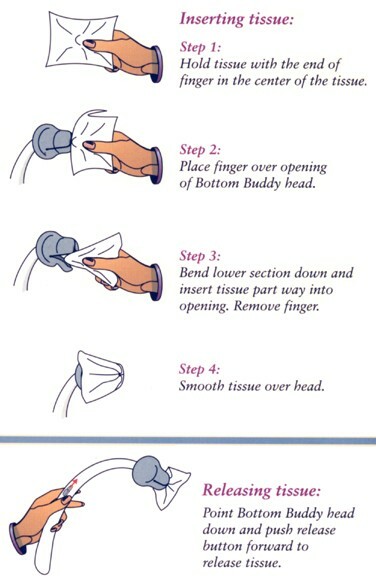 The Bottom Buddy Toilet Tissue Aid is a must have for personal hygiene needs when reaching is difficult or impossible. The bottom wiper can be used with any toilet paper, tissue or pre-moistened wipes. 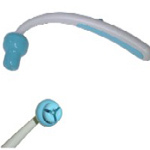 A soft, flexible head grips any tissue or pre-moistened wipe securely and releases the paper with the push of a button. And, it comes with its own washable, vinyl, "can't see through" storage case. You can take your Bottom Buddy with you, wherever you go, without anyone being the wiser. The head of the Bottom Buddy is two inches long and 1 3/4 inches in diameter at its widest. The Bottom Buddy is ten inches long with its curve and it would be 13 1/2 inches long without the curve. To release the tissue, simply point the head down and push the release button forward to release the tissue into the toilet bowl. Please shop carefully, due to hygienic reasons, this item cannot be returned.